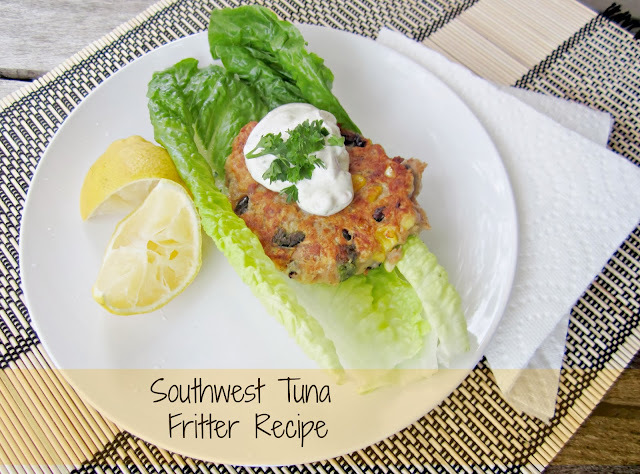 With this fresh tuna fritter recipe we move beyond the normal tuna casserole or tuna salad sandwich recipe. I wanted to take tuna and make it fun, delicious while still being healthy. I love using tuna in recipes because it contains lots of healthy Omega 3, fatty acids, and protein. Fatty acids are something I am always trying to get my family to ingest more of. Fatty acids are naturally occurring in things like kale, spinach, nuts, or brussel sprouts. I gotta say, the kids run for the hills at the sight of those green foods (with the exception of broccoli) but when they hear that tuna is being prepared they get excited. I try to incorporate tuna into our meals twice a week, that is what the FDA recommends. Tuna just tastes so good! The tuna I am using for my recipe is Ocean Naturals skipjack chunk light tuna in water. This premium tuna is wild caught responsibly. Skipjack is an abundant fish that scientists have labeled as flourishing. This tuna is tender, delicious, good for you, and good for the planet. Other brands don't tell me where my tuna fish comes from. The source of my food is something that I would like to have more control of. With Ocean Naturals I can find out more about where your tuna comes from by using this link. 3) Take 1/3 cup size portions and flatten them with your hand into a round patty. Place a few patties into the hot oil and cook for about 3-4 minutes on each side until golden brown. Once cooked through I just set mine on a paper towel for a minute before serving. 4) Mix up the dressing ingredients: ranch mix, sour cream, avocado, tomato and seasoning. I garnished with some fresh parsley but cilantro would be great too. I put mine in a normal bowl to serve with my fritters. 5) Pull apart the romaine leaves and set two on top of each other on a platter for serving. Place 1 fritter on top of each pair of leaves then you are ready to serve with the dressing and enjoy. Just fold the lettuce leaves around your fritter and eat with your hands. 6) You could win some free product from Ocean Naturals! Just go to their Facebook page to enter to win in the Ocean Naturals Tuna Tuesday Giveaway.